I can still recall, clear as day, what it was like to walk into the old Nuttall Street Stand; the smell, the sounds and when I was lucky enough to have a pie bought for me, the flavours too. The creaks and groans from the wooden beams and staircases, the unique whiff emanating from the gents loos and the gloom around the snack bar. Even the low wattage light bulbs had a role to play, doing their bit to save a few pennies on the club’s electricity bill. My first visits to Ewood actually were to the Riverside, sitting in the seats above that famous old terrace or more accurately on the bench seats in the wings. The admission was cheaper and frankly me wanting to go to the football was seen as a fad that would soon run its course. Not the first time, I confounded my parents with my unique take on the world and here we are more than four decades later, I’m still proving my point. Nothing if not tenacious, that’s me. Football supporting back then seemed to be a whole lot easier though. As a kid I would have a fixture list sellotaped to the inside of the wardrobe door. Within a couple of days I would have pretty much memorised it, safe in the knowledge that fixtures would be rearranged only in the event of a postponement following bad weather or if we were to be particularly lucky, an FA Cup run. It was cash on the turnstile, rarely a need for tickets in advance and in fact as a very small boy; it was not unheard of to be hauled up and over the stile with a modest cash adjustment (adjusted for inflation) being passed over in the other direction. This tactic seemed to work well especially at away grounds and made it more economical for me to be taken to a number of local away games. Terraces were not particularly welcoming to the diminutive me, barely able to see over the wall, so sitting in the stand was a treat that at least meant I could see the game. I was taken to the likes of Gigg Lane, Spotland, Bloomfield Road, Deepdale and Burnden Park. Soon my tastes craved some exotic flavours and a trip to the Old Showground in Great Harwood to watch Ronnie Clayton, Bryan Douglas and Roy Vernon turn out for their new club gave my elders and betters a chance to regale me of their history and what a privilege it was to see them first hand. They were of course entirely correct, but it was a little while until I realised quite why. Some years later I would play on that very pitch in an U15s cup final* and the memories came flooding back. Replica football kits existed even back then, but the great thing was, you could buy one shirt and have about 23 kits instantly. A red shirt with white round neck collar and cuffs was good for Liverpool, Manchester United, Barnsley, Swindon, Crewe, Doncaster and even Great Harwood if so inclined. Paired with an all white one, this opened up international options, England obviously; but also domestically, Leeds Utd, Spurs, Fulham, Millwall, Bury, Preston and so on. For a child with a vivid imagination, background kickarounds rarely featured the same two teams but no costume change required. These days I really like to people-watch at football grounds but especially the young kids…oh hang on, no; not like that, what I mean is, I want to feel reassured that they are as excited by the whole experience now as I was back then. I am not one of those people who believes that “everything was better in the old days” but I wonder what our youngest fans make of the whole experience of being a modern day football fan ? I would have relished the wall-to-wall availability of information, statistics, video clips let alone the amount of live TV, which sees games from all around the globe being available 24/7. No waiting for that week’s Shoot magazine to check up on the line ups of divisional rivals in last week’s games ! The state of modern grounds has improved beyond measure since the terrible tragedies at Bradford, Heysel and Hillsborough caused football to re-evaluate its principles and practices. Almost all grounds now have family sections and dedicated facilities for disabled spectators, although these can always be improved. I can only imagine how over-stimulated the five year old me would be walking around a club megastore these days. The thought of personalised kits, matching training gear, tracksuits, coats and even boots would possibly have blown my mind. I was never short of anything as a kid but these places tempt me now ! The only real area of concern for me is the cost of all this. How do we ensure that the next generation is able to enjoy the match day experience, home and away ? Their footballing future is obviously the future of our football – it therefore relies on all of us to do everything we can to pass on the baton. It relies on footballing authorities to use the TV millions to keep ticket prices sensible and stadiums full – with the average spectator age reducing, not as it is at the moment. Football-supporting these days in some respects is fundamentally different to the experience I had as a kid but in so many other ways; the visceral excitement, the passion, the noise, the joy, the despair; that remains unchanged - long may it remain so. *we lost 2-1 but thanks for caring enough to read to this footnote. I still have the runners-up medal. First time I went to Rovers as a kid it cost me 1 shilling and 6 pence to get in ( 7.5p ) in today's money. At Utd it was 1 and 3, even cheaper. I was getting 12 shillings and 6 pence for my paper round so work out how many games I could go to in a week. Most times I went to 2 games, sometimes 3 and now and again 4 games in a week. I also bought a programme for most of them. Train fare to Maine Rd, Burnden Park, Old Trafford was peanuts. Bus fare to Ewood, Bury , Oldham, Burnley wasn't much more. Rochdale I could walk to. No faffing about with tickets and away ends. You rocked up, put your money down, and walked in. Sounds to good to be true and yet people tell me football is better than ever now. I was born abit to late for all that sadly . Would I be right in saying that you could blame the hooliganism of 30/40 years ago for that? Probably. There were plenty of dickheads at football matches then. Not really if looking at those particular points although it did make crowds difficult to monitor. Football was a point where tribal instincts flourished, and the same was occuring in the deprived ghettos of most British towns. Hooliganism had its roots in the Political and Social conditions of those times. There are dickheads in all walks of life, not just in Football, and still are. LIVERPOOL, England — Trent Alexander-Arnold shuffles uneasily on his feet. He is standing in the assembly hall at St. Cuthbert’s, a Catholic primary school in Liverpool, a few minutes’ drive from the part of the city where he grew up. About 50 or so children sit on benches in front of him. Some beam with pleasure. Some whisper excitedly. Most just stare at him, as if he has descended from another planet. This, certainly, is a new world for Alexander-Arnold. It is barely more than a year since he made his Premier League debut for Liverpool, his hometown team, and a few months since he scored his first goal. He is 19. He remembers what it was like to be one of those children, eagerly hoping for a visit from Steven Gerrard or Jamie Carragher, and he still finds the idea that he might now be anyone’s hero a little strange. “It still hasn’t caught on for me, really,” he said. On a cold Friday morning in December, he is here on behalf of a local charity called An Hour for Others. The organization has prepared hampers, packed with food, to be handed out to some of the most underprivileged children at the school. It is the sort of initiative most Premier League teams — most sports teams across the planet, in fact — run every Christmas. Players visit fans in the hospital, or arrive unannounced at schools. Alexander-Arnold’s visit to St. Cuthbert’s is different. He is here with the blessing of his club, but not at its behest. He has not been sent here as part of Liverpool’s community program. This is his morning off — he is due in for training at 2:30 p.m. — and this is how he has chosen to spend it. The concept behind the program that connected him with St. Cuthbert’s, An Hour for Others, is simple, self-explanatory. One of the group’s founders, Kevin Morland, a painter and decorator, decided that his time and skills could help those in need more than his money. He started off redecorating children’s bedrooms in some of Liverpool’s most deprived areas at no cost to residents, and slowly the concept spread. Now, An Hour for Others offers everything from cooking classes taught by professional chefs to dance, yoga and science sessions. Some people volunteer their time, others their equipment or access to their property. Alexander-Arnold was still just a hopeful at Liverpool’s academy when he became involved. His mother, Diane, recommended one of the charity’s first beneficiaries to Morland and his partner, Gill Watkins. 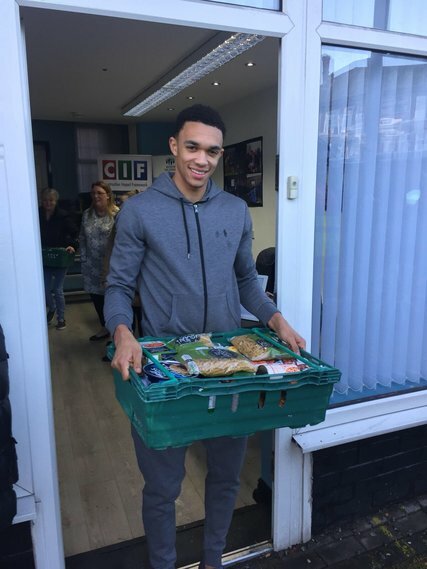 Alexander-Arnold, in his midteens at the time, was summoned early one morning to help load boxes of donated toys into Morland’s van. From that point, he said, he was determined that if he ever had a career as a professional he would use his success to promote the charity’s work. Together with Kris Owens, whom he called his best friend at Liverpool’s academy, Alexander-Arnold sketched out a plan years ago. “We said that if either of us made it, we would help out the charity,” he said. 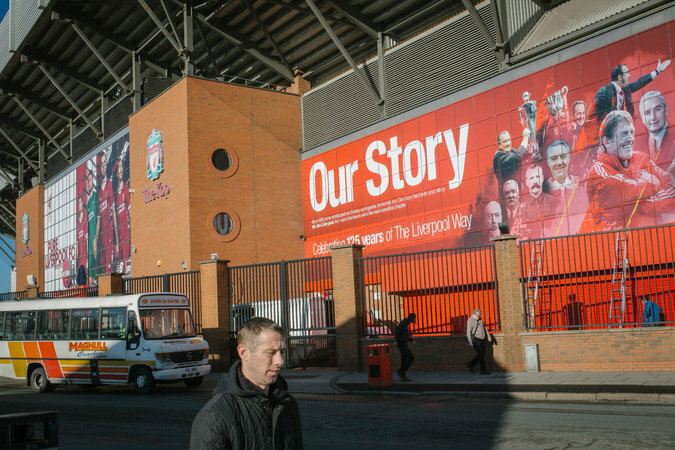 Over the last decade or more, the academies of Premier League teams have morphed into factory farms, designed either to generate talent or create revenue. Clubs invest millions every year into scouting, recruiting and training the brightest young prospects, with the aim either of unearthing future first-team stars or mass-producing players to be sold, preferably at a healthy profit. Clubs have built state-of-the-art facilities that resemble, more than anything, vast industrial complexes. It is fitting: Youth development has become an exercise not in education, but heavy industry. Accordingly, the conversation around which academies are succeeding and which are failing is based solely around their output of professional players. At best, academies are seen as existing solely to bring talents into the first team. At worst, they are seen as an additional source of income, a way of bringing in money that can then be invested in the transfer market. To maximize their usefulness, clubs have long signed players not just from around Britain, but from across Europe (and sometimes farther afield). All clubs cherish homegrown players — not least because, in the Premier League and the Champions League, a squad must contain a set number of them — but few care anymore where home actually is. Cesc Fàbregas was born and raised in Barcelona, but counted as a homegrown player at Arsenal. Andreas Christensen, a Dane, is the apogee of Chelsea’s youth system. That unapologetically internationalist, industrial approach is understandable, given the intensely competitive environment in which clubs exist, but it means one significant element has been lost. Local players are not desirable because they are cheap, or plentiful, but because they bond a club to its community. They give it a sense of place. 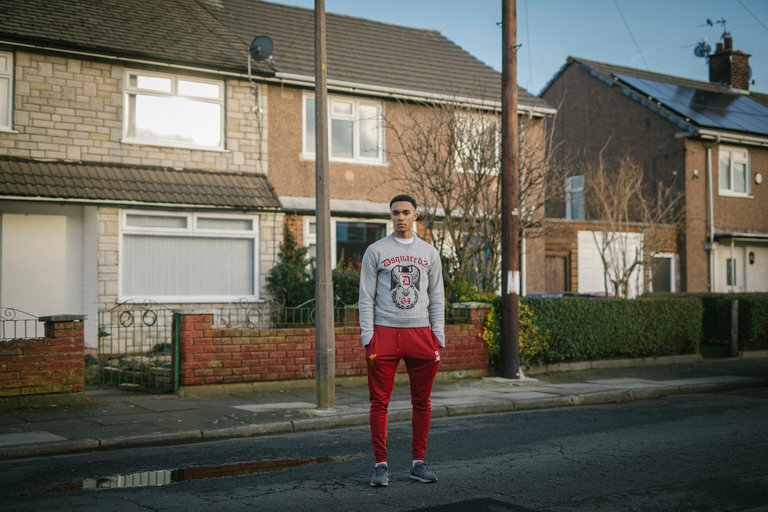 “My house is just over there, the one with the purple bins,” Alexander-Arnold said as he drove to another appointment with An Hour for Others, at a community center not far from Liverpool’s Melwood training facility. They dated for 18 months or so as teenagers in Glasgow “before it suffered the fate of most first romances and petered out,” Ferguson wrote, and ended completely when Carling moved to New York and married. (Because of this, Alexander-Arnold, technically, is eligible to play for the United States national team.) More remarkably, one of his mother’s cousins, John Alexander, was for a long time Manchester United’s club secretary. Ferguson once asked Alexander-Arnold, not long after he had first signed to join Liverpool, why he had not tried to join United instead. “My mum doesn’t drive on motorways,” was the immediate response. 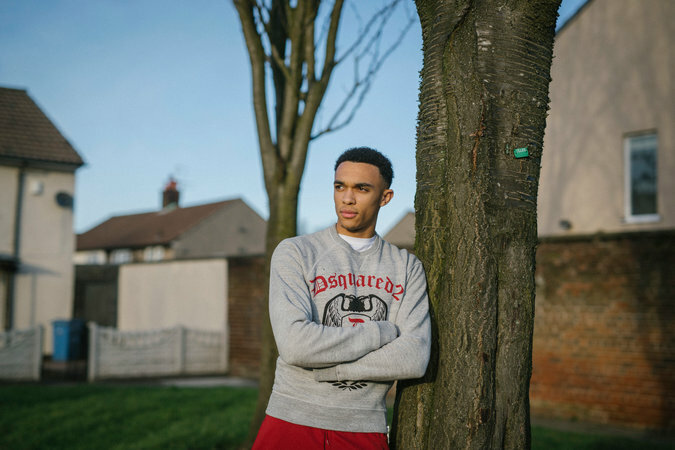 In reality, though, Alexander-Arnold wanted to be a homegrown player, in the truest sense of the term. He is from this city and he is of it, too. He points to the park where he used to play soccer after school, where there were “always a few people looking for trouble.” He has friends who found it, and whose lives have diverged drastically from his as a result. He still lives with his mother, albeit in a slightly more upmarket suburb, but still feels the pulse of the city. In the ruthless, globalist Premier League, such considerations seem quaint. What fans, owners, managers and players want is success — this weekend, this season. A team having a local heart is no more than a sweet anachronism. What matters more is that clubs have top-class players, not where those players are from. 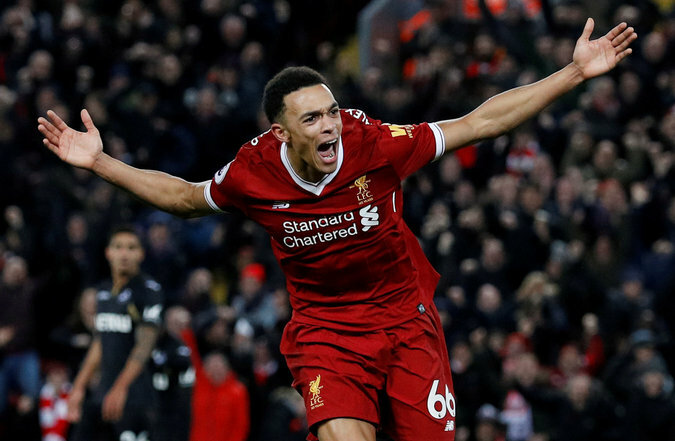 Yet the enthusiasm with which Liverpool has embraced Alexander-Arnold suggests that something, in the rush to industrialize youth systems, has been lost, and is being missed. Clubs are now international brands, with worldwide appeal and distant horizons. At heart, though, they are still local institutions. They do not exist on a different planet. They represent a place, and sometimes, still, they reflect one, too. and nice to see a story like that for a change phillip.